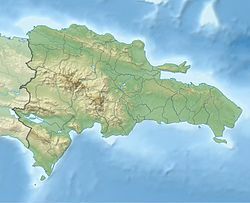 Peralta is a municipality (municipio) of the Azua province in the Dominican Republic. The village resides at between 5,000 and 7,000 feet in the mountains. It is about a 40 to 50 minutes trip up and down the mountain to the city of Azua de Compostela. The village is primarily focused on agriculture, livestock, and fruits. Electricity is available for all inhabitants in Peralta. However, it does go out from time to time. Blackouts can range from an hour to the whole day. There are two rivers in the village, many of the villagers bathe in the river even though they have access to running water. There are a total of four major barrios: Los Jobos, El Higüero, El Mercado, Camboya. People tend to blast music out of their stereo usually meregue, bachata, or reggaeton. Reggaeton tends to be the favorite among the youth. Peralta works with Plan International- an organization that works worldwide to achieve lasting improvements for children living in poverty in developing countries. Peralta has also hosted volunteers in 2003, 2006 and 2010 from Amigos de las Américas, a nonprofit organization based in Houston, Texas dedicated to creating opportunities for young people to excel in leadership roles promoting public health, education, and community development throughout the Americas.